WE HAVE WRITTEN THIS BOOK as a guide for faculty in the biomedical sciences who are considering consulting opportunities with industry. We have frequently observed academic scientists who, although diligent to the point of compulsion when it comes to their research, are indifferent to the contents of the consulting contracts they sign. Whether you fit this phenotype or not, we hope this book will help you see that what appears in a consulting contract in the fields of medicine and biotechnology might matter very much and is worthy of the same careful review as, say, a will or other legal document. We highlight issues that we have encountered and discuss how they can be addressed. We hope this book will convince you that it is worthwhile for you to read and understand any consulting agreement that you sign and to ensure that it accurately describes the parties’ mutual expectations. The negotiation of consulting agreements between academic faculty and companies in the biotechnology and pharmaceutical industries often involves a contrast of cultures. On one side is an academic research scientist who is generally accustomed to openness and trust in interactions with laboratory colleagues but who might be impatient with paperwork and is not usually enamored of lawyers and “legal stuff.” On the other side is a company that is motivated to protect discoveries and trade secrets and that relies on lawyers in conducting its affairs. On yet a third side is your employer, a university, hospital, or research institute, the affairs of which are more and more prescribed by policies written by lawyers or other risk-sensitive administrators. When a company asks you to consult, not only the interests but also the points of view can be quite distinct. The goals might be different, too. You might look at the relationship primarily as an opportunity for intellectual interaction, a chance to make a more direct impact on human health and maybe the possibility of earning some extra money, and as such might give little thought to the specifics of the contract. By contrast, the company probably wants your services to improve their products or research and development (R&D) and regards the relationship as a business proposition. And your institution might want to protect your independence as well as its stake in your future intellectual property (IP). Disparate points of view can meet when a scientist at an academic institution discusses a consulting project with industry. The company operates in the business world, and the business world operates via contracts and the give-and-take of negotiations. In that world, it is expected that the party drafting a contract will write provisions favorable to its interests and leave it to the other party to raise an objection or offer a counterproposal. So, whereas a company will write the consulting agreement to be favorable to its interests, not out of malice but out of practice, you the academic might not know this and indeed might believe that you are expected immediately to sign on the dotted line—or risk offending the company. Furthermore, you might not have the expertise to know which provisions to question and how to modify them to your best advantage. One might hope that these differences in expectations and experience will have no important implications: The parties will work together well in a stimulating and synergistic way, you will be paid what you expect, and when the time comes the relationship will conclude amicably. But whatever the context, people put contracts in writing so they are protected if something goes wrong. Sometimes, with consulting agreements, things can go wrong. • Your contract does not accurately describe your consulting fee and says nothing about the stock options you thought you were getting. Meanwhile, your company contact—the one who negotiated the terms with you—just cashed out his options, quit the company, and threw away his cell phone. His successor can find nothing in the files about your options. • The company publishes a paper with your idea. Your laboratory has been scooped. • The company patents your idea. Your university thinks it belongs to them and sends the company a cease-and-desist letter. The company shows your dean a copy of an IP assignment with your signature on it, and you admit you signed it during a company visit without giving it any thought. The idea is worth millions, and it looks like neither you nor your university will receive royalties. • You want to consult for another company but your contract bars you from doing so. • You are a principal investigator for a clinical trial, and you share exciting unpublished data with a friend who works at a company for which you consult. The company buys stock in the pharmaceutical company that owns the drug being tested. The Justice Department announces an investigation of insider trading concerning the pharmaceutical company stock and says indictments are pending. You are served with a subpoena. The sponsoring company calls its lawyers. • You are awarded stock options, and you exercise them but do not sell the underlying shares. The market price plummets and you are hit with a tax bill based on the price at the exercise date. You cannot raise enough cash to pay the tax by selling the shares at the current price, and you end up owing far more to the Internal Revenue Service (IRS) than you have ever received from the company. • In the summer of 2005 the SEC commenced a criminal investigation of physicians who were conducting clinical trials and allegedly sharing unpublished data and trial results with Wall Street firms that had retained them as consultants.8 According to The Seattle Times, which first reported the practice,9 the Wall Street firms hired the clinicians to get a jump on the market—if the clinical results were strong, the firms could buy the stock of the sponsoring company before the price went up; if not, they could short the stock and make money that way. According to The Seattle Times, the clinicians supplied this information in violation of their contractual obligations to the companies that underwrote the trials. Moreover, according to the newspaper, the SEC intended to investigate whether the disclosures were violations of federal insider-trading laws. Clinicians who were targets of this SEC investigation might have faced disciplinary investigations at their medical centers and if so would have expended time and money preparing to defend themselves against the government or the companies that had underwritten the trials. Needless to say, the enormous increase in consulting by biologists and clinicians over the past two decades has come at the same time that the stakes have gotten higher, and universities, hospitals, and research institutes are paying increasing attention to both the potential problems and the opportunities to strengthen their finances. 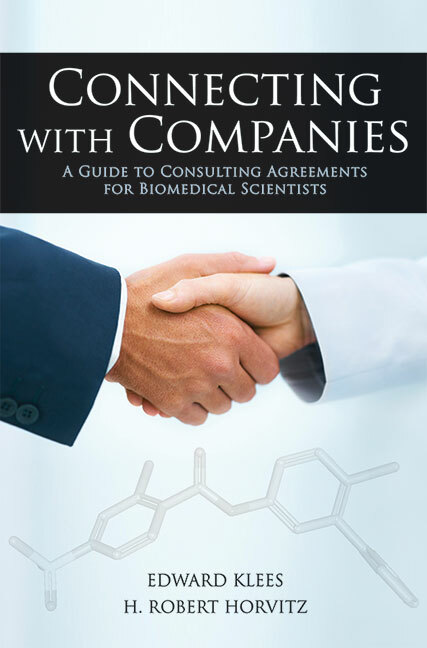 Both authors of this book have experience in reviewing and negotiating biomedical faculty consulting agreements, and we have written this book to help guide faculty concerning the ins and outs. The two major messages we hope to convey are simple. First, you should read and understand a consulting agreement before signing it. To sign without reading invites the admonition Caveat emptor (“buyer beware”)—or, more precisely, Caveat consiliator, or “consultant beware.”10 Second, the agreement should accurately reflect what the parties plan to do. There is nothing as important as each party’s properly setting expectations for the other. This book discusses issues specific to consulting contracts. We consider issues that are general in nature and also, for those who want more details, particular clauses often included in faculty consulting agreements. We have appended a sample of a basic consulting agreement (p. 121, Attachment A). It is important to note that we are not advocating a specific set of consulting terms, including those we present here. The resolution of issues in any given consulting agreement depends upon many factors, including who the parties are, their goals and interests, and their respective bargaining positions. What might be important to one person might be trivial for another. For example, one scientist might care greatly what happens to her potential holdings in the case of her death, but another academic without a family or a favorite charity might care little about what happens to his promised shares after he dies. Conversely, one company might desperately need your expertise, whereas another company might not. One company might have ample funding and plenty of stock options; another may be a start-up with little cash. The review and negotiation of a consulting agreement are dependent on the parties and the setting and can be evaluated only by the parties and their lawyers or other professional advisors (for example, in lieu of a tax lawyer, a good accountant can be crucial to evaluating the tax impact of various equity alternatives). There are no “right” or “wrong” positions in a negotiation, and the optimal positions cannot be predetermined. This book is intended to help with identifying issues and is not meant to prejudge any particular outcome. We stress that the negotiation of a consulting agreement need not and generally will not be adversarial. Rather, both parties can share the goal of using the negotiation to define explicitly in writing their shared expectations concerning the nature of the consulting arrangement. If a negotiation is handled well, the parties can feel closer and more energized. Consider that many of the terms that are advantageous to a consultant are not detrimental to a company, and vice versa. A lawyer can help you evaluate the terms that are important for you. The negotiation should simply be a means of determining and specifying the best combination of terms in the context of the overall interests of both parties. In addition, neither a consultant nor a company wants to begin a consulting arrangement in the wake of a hostile negotiation. Consulting agreements are by their nature legal documents, and our discussion addresses legal and tax issues. Nonetheless, as stated in the Disclaimer, we stress that we are not furnishing legal or tax advice. We encourage faculty to retain an experienced lawyer for advice, particularly for complicated contracts involving potentially sizeable financial interests. Whenever there are complicated issues or tax questions, expert advice is money well spent. To get a recommendation for a lawyer, check with colleagues who have used a lawyer for negotiating their own consulting agreements or ask the faculty union or a local bar association to recommend someone who is experienced with consulting contracts. Guidance also might be available from the university’s general counsel or the head of the technology transfer office—and, indeed, you might be required to speak with them about the relationship anyway. As an absolute minimum, get advice from a colleague who has not only signed but more importantly has negotiated multiple consulting agreements.